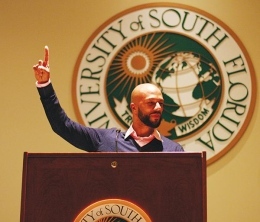 Rapper, actor and author Common kicked off this year's first University Lecture Series (ULS) speech with a freestyle rap, name-dropping Fletcher Avenue and Lee Roy Selmon before ending with, "I came to University of South Florida to talk about greatness." Greatness was the topic Common spoke about to an estimated audience of 1,200 Monday night in the Marshall Student Center Ballroom. The lecture was titled "Common: One Day It'll All Make Sense" - also the name of his new memoir. The Chicago-born performer said his first experience with greatness came from learning in school about Emmett Till, a 14-year-old black boy who was murdered in 1950s Mississippi after whistling at a passing white girl. While working as a ball boy for the Chicago Bulls, he said he felt Till's ghost in the darkened hallways in the stadium until one day he finally faced his fears. "At the moment, I felt a spirit and I knew that spirit was there," Common said. "It was the spirit of Emmett Till. He was right there, telling me that something great is in you. ‘Greatness is in you. More than you can even imagine, greatness is in you.'" Another formative moment in Common's life, he said, was visiting Cincinnati with his cousin when he was 14 and writing raps about the local group Bond Hill Gang. "You know what makes you thrive, what makes you get energetic, what gives you that spirit like, ‘Yeah, I want to do this,'" he said. "That's what I had discovered in hip-hop. I had found my path." Beyond releasing albums such as "Resurrection" and "Like Water for Chocolate," Common was in a relationship with singer Erykah Badu, and "during the heartbreak" of the relationship's aftermath he said he "discovered a lot of things" about himself. One place Common said he found inspiration afterward was from fellow rapper Kanye West, who produced Common's 2005 album "Be," hosted listening sessions for his debut, "The College Dropout." "Kanye. during every listening session, would be hopping up on the table and rapping his songs and sweating, feeling it and spitting on people," he said. "There was a point where he'd start doing songs that I didn't even like that I started (to), because belief is contagious." Common has already started his acting career, which includes films "Smokin' Aces" and "Wanted" as well as the upcoming AMC series "Hell on Wheels," when he said he received a pivotal phone call in 2006. "I was doing ‘Smokin' Aces' and I got a call about ‘Be' and they told me, ‘Man, you've been nominated for five Grammies,'" he said. "So then it felt like this belief thing is for real." He ultimately didn't win any of the awards that year, but said such struggles are important to achieving greatness and he still feels those struggles. In 2008, he finally earned a Grammy for his song, "Southside." "Each time I do something or achieve at a certain level, it becomes more difficult to rise," Common said. "It's like going up a mountain because the higher you go up … the higher the altitude is and it's harder to breath. But the higher you go, just take a breath and appreciate where you are and know that you're trained enough to go higher." 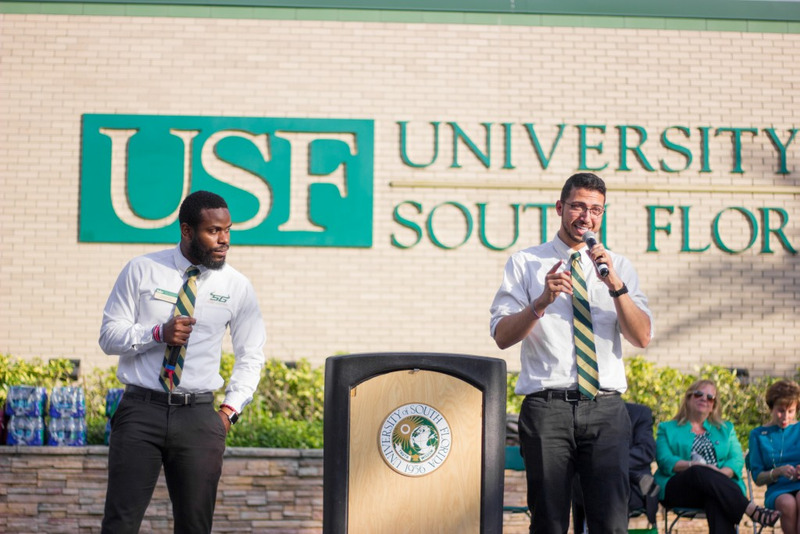 Romando Purcell, a junior majoring in psychology, said he attended the event because his history with Common stretches back to his childhood. "(I heard him) from my mom - I was like five," he said. "I've been listening to him pretty much my whole life."